Instant Pots – have you tried them yet? Love them? Hate them? Completely indifferent? I think for the most part I’m on board. Anything that can reduce the amount of pots and pans that I need to wash up in a day gets a gold star from me. I’m also forever in awe of the fact that I can put a frozen piece of chicken in the pot and come back in less than 20 minutes to it being fully cooked. To be honest though I’m not fully sold on making everything in the instant pot. I just feel like there are some meats and stews that really benefit from the low and slow method where all the flavours get a chance to hang out and really know each other over more time. Or maybe I just need to try new recipes! That being said – when it comes to chicken breasts I am always impressed with the speed and flavour you can get out of such little time – like with these Instant Pot Chicken Carnitas! They’re so juicy and tender and easy to shred. For these alone I’m convinced my instant pot is more than worth it! 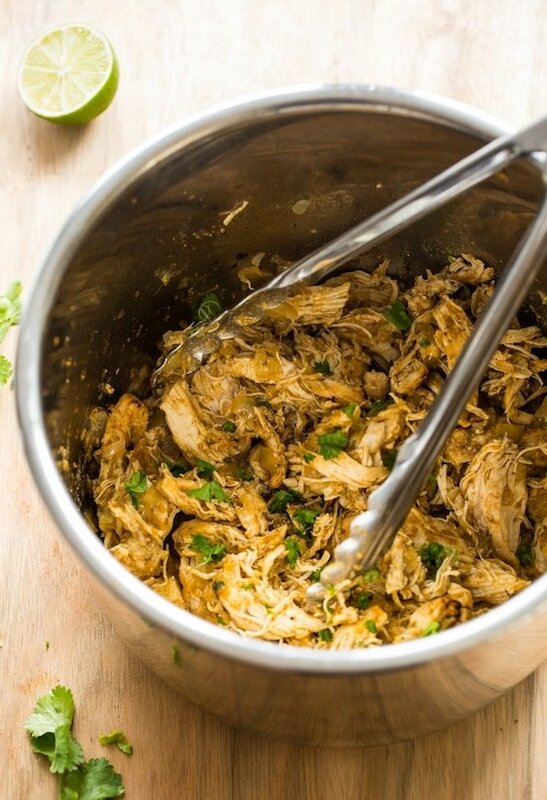 Like most instant pot dished making these Instant Pot Chicken Carnitas is a pretty simple and straightforward ordeal. All you need is about 10-15 minutes of prep: gathering ingredients, sautéing your veg, and throwing it altogether before securing the lid and walking away. From this point on it’s just a matter of letting it all cook until done. Mix your spice blend in a small bowl: cumin, oregano, salt, pepper & chili powder. Sauté your onion and garlic in a little olive oil. Stir in the juices stock and spice blend followed by the chicken blend. Set to cook for 8 minutes and then walk away. 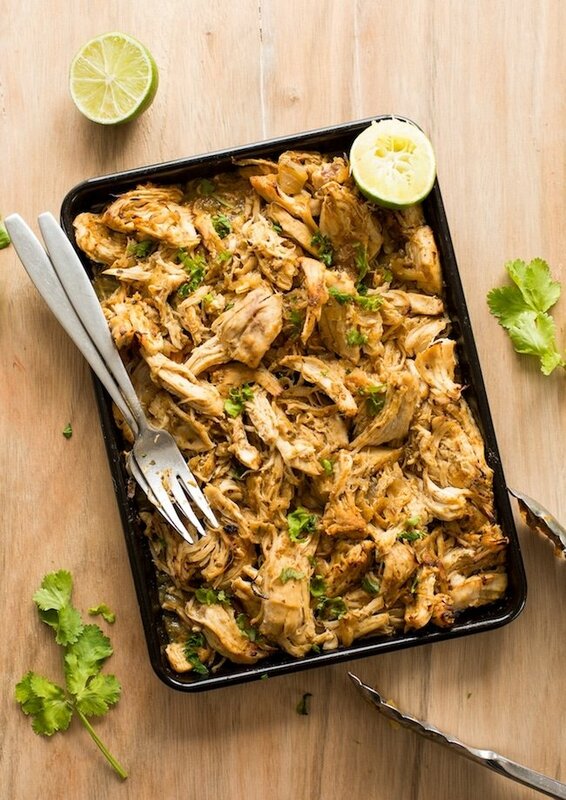 After your timer has gone off and you remove the lid your chicken will look like this picture below – just use a couple of forks or tongs to shred the chicken. It’s important to note that at this point your chicken will be looking very juicy from all the liquid needed to cook in the instant pot. You can, if you like, stop right here and enjoy the chicken as is. In salads and burrito bowls the extra juice really add a lot of extra flavour that you don’t want to miss out on. However – if you’re looking for crispier chicken carnitas then just finish these off by broiling them in the oven for a few minutes to crisp up the edges. When you’re all done just spoon a little bit of the leftover liquid at the bottom of the instant pot over the top and enjoy! If you’re into meal prep it’s a great thing to make and have on hand to add to different types of dishes. These Instant Pot Chicken Carnitas are great in tacos and burritos. You can also add them to soups, quesadillas, nachos (that recipe is coming up later in the week!) and more. Don’t forget to #asaucykitchen on instagram if you try these Instant Pot Chicken Carnitas. I love seeing what you make! You can also post your pictures to my facebook page! Mix the cumin, oregano, salt, pepper and chili powder together in a small bowl. Add the olive oil to the Instant Pot (affiliate link) and press the "Sauté" button. Once the oil is warm add the onion. Use a wooden spoon to stir and cook until the onion is fragrant and soft, about 3 minutes. Add the garlic and stir for another minute. Stir in the pineapple juice, lime juice, chicken stock and spice blend. Mix to combine. Add the chicken breasts to the pot and stir to coat. Press the "Keep Warm/Cancel" button to stop the sauté function. Secure the lid and make sure the steam valve is set to closed. Press 'Manual' or 'Pressure Cook' and set the timer to 8 minutes. After the time is up the Instant Pot will automatically switch the keep warm. Let it keep warm for 10 minutes before releasing the steam valve. Once the steam has been fully released remove the lid of the instant pot. Use a couple of forks to shred the chicken. Preheat your broiler to high heat. 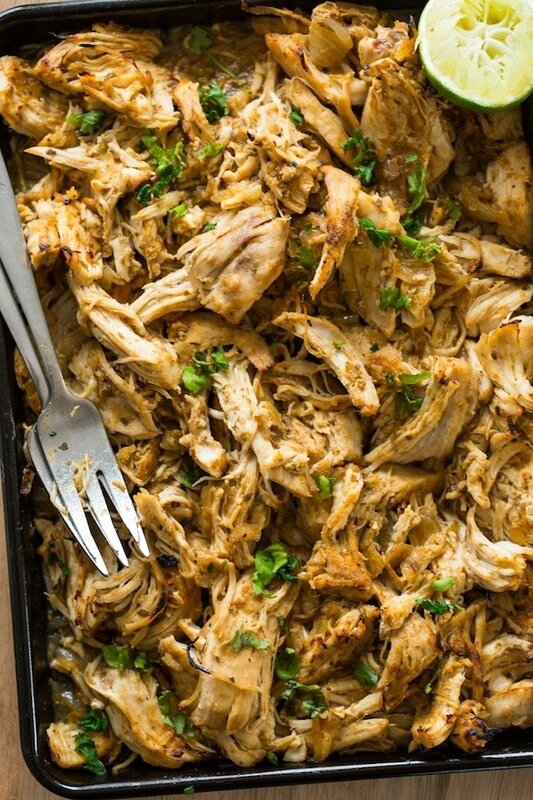 Use a slotted spoon to transfer the shredded chicken to a large, lightly greased baking sheet. Spread the chicken out to be in an even layer. Broil high up in the oven for 5 minutes. Remove the baking sheet from the oven, spoon some of the leftover juices in the instant pot over the top of the chicken. Toss to coat and then place back in the oven to broil an additional 5 minutes. Squeeze a little more lime juice over the top and garnish with freshly chopped cilantro. Serve in tacos, burrito bowls, over nachos, quesadillas, etc and enjoy! do you know how to use a nuwave pressure cooker to make this? I got a nuwave pressure cooker as a gift, and literally don’t know how to use it/can’t find any good recipes. Every time I try to let the pressure release it just keeps cooking. I scrolled the comments before asking this… what is the cooking time for frozen chicken? Hi Sara! 10 minutes should be enough if you let the pressure come down naturally! I tried this recipe as it is and we LOVED it! How do I adjust the ingredients for 3 lbs of chicken? Hi Aysha! So glad you liked it! To make enough for 3 pounds I’d double all the other ingredients and then just increase the amount of chicken from 1-3 pounds and add an additional 2 minutes to the cook time (so 10 minutes instead of 8). Hope that helps! Mee Too, but there are two things we make all the time. Yogurt & Hard Boiled Eggs. The Yogurt function works great and Hard Boil eggs almost de-shell by them selves. Thanks again for a nice recipe. Hi Richard! You’ve just reminded me that I need to try making my own yogurt in the instant pot! I agree with you on the hard boiled eggs too – so easy! Thanks Nina! Congrats on your new baby! I am about to cook this in my new 8 qt instant pot (first timer) & I wanted to confirm that you don’t think I need to adjust times and settings since it’s not a 6 qt pot. I am also doubling the recipe and I saw that you said 10-12 mins for 2 lbs of chicken. Correct? Hi Katrina! 10 minutes in an 8 qt pot should be alright – hope that helps! Can you make this without an InstantPot? Hi Ann! You should be able to make this in a slow cooker. Increase the chicken stock to 1 cup and just add everything to your slow cooker – stir to combine and then cook on low for 6-7 hours. How would you adjust to make this in a crock pot! Hi Shan! Increase the chicken stock to 1 cup and just add everything to your slow cooker – stir to combine and then cook on low for 6-7 hours. Hope that helps! 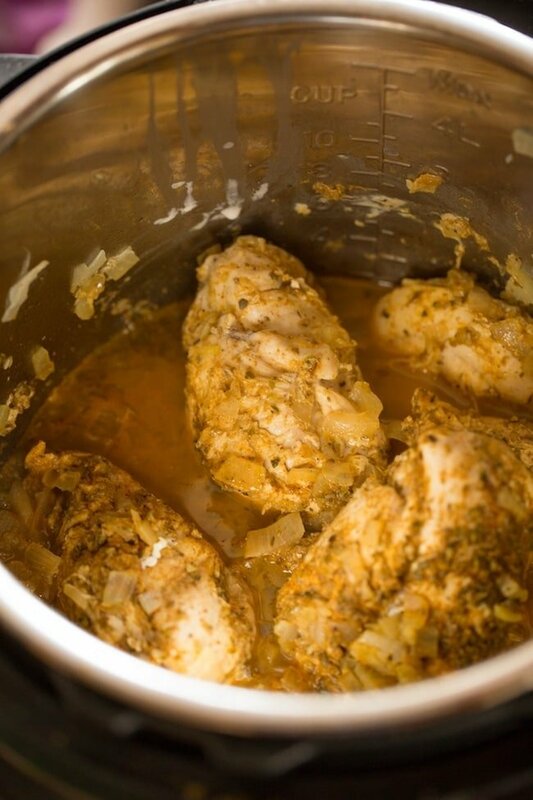 Do you know if I use boneless skinless chicken thighs if the cook time needs to be adjusted? It’s what I have on hand. Hi Maggie! If it’s boneless and skinless then the same amount of time will be perfect! Can’t go wrong with ever adding more spice! Thanks Erin – so glad you liked it! Oh no! It definitely shouldn’t have been dry – before closing the lid did you submerge the chicken in the liquid? Loved it! Do you have a similar recipe for beef carnitas? Really enjoyed the extra juices in the dish. Thanks!! Thanks Richa! I don’t yet but I do plan on making one soon! What would be cook time for 4 lbs of chicken? This was a big hit with my family! 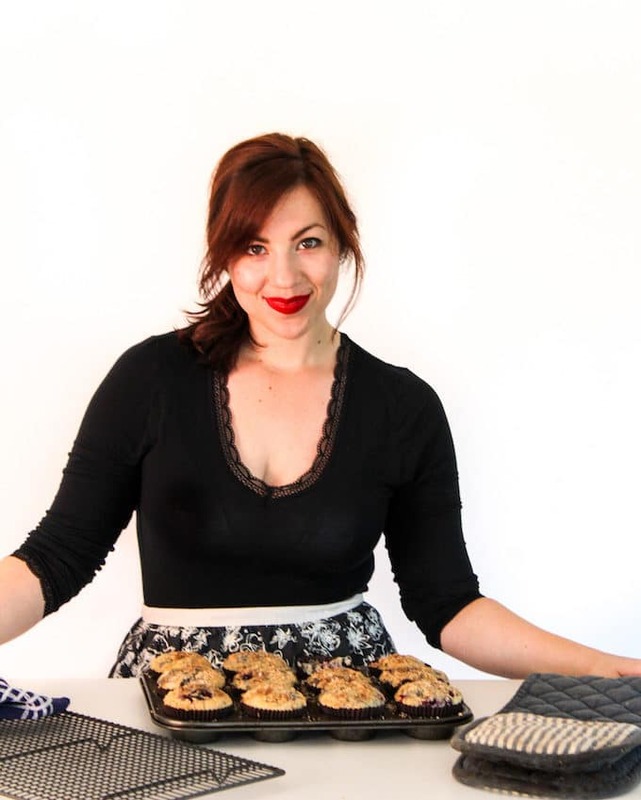 It’s recipes like this that makes my instant pot really feel worth it! Thanks for sharing. Thanks Erin – so glad you guys liked it! Hey, I made 2 lbs by doubling the ingredients measures and cooking for 11 minutes as you had recommended in a comment reply. It came out great. My family loved it. Thank you so much! That’s great! Thanks for letting me know how it went – so glad you guys enjoyed it! Made this tonight in my 8 qt IPLUX. Modified it for 5 lbs chicken since we have a huge family and it was a total hit!!! So glad you guys enjoyed it! Thanks for coming back to let me know what you thought! Was this made with a 6 or 8 quart instapot? Do cooking times matter? Hi Laura – this was made in the 6 quart instant pot but you should’t need to change anything about the recipe. The main difference between the two here is that the 8 takes longer to come up to pressure/temperature but the actual cooking time stays the same. I am pretty new to the IP world Must I brown the chicken before adding it to the garlic and onions? Hi Jen! You don’t need to brown the chicken here here as long as you crisp up the chicken under the broiler in the end. Why do you crisp the chicken? Thank you or the recipe! If I wanted to cook 2 lbs of chicken at once, would U double the pressure cooking time? Hi JC, 10-12 minutes should be a good time for 2 pounds of chicken! We love this recipe so much! I’m actually making 10 pounds of it right now as part of a taco bar for my stepdaughter’s wedding. Love that it’s extra ‘saucy’, so it will hold well in a warming dish on the buffet line! Aww that’s so cool! I’m glad you guys like it! Congrats to your daughter too by the way!